If you've been around my blog or Facebook very long, you may have noticed the we love the zoo! Every year that we can afford to, we purchase a family membership for The Montgomery Zoo and the Mann Wildlife Museum (adjacent to the zoo.) The membership is good for a year and includes unlimited free admission to the zoo (and the museum if you add that to your membership) all year long plus free and discounted admission to other reciprocating zoos and aquariums in North America. There are also member only events, discounts on food, gifts, catering and shelter rentals and an annual subscription to the zoo's bimonthly magazine-Jungle Drums. I think it's worth the money. My kids love the playground at the zoo and with a membership there is no pressure to see everything-to "get our money's worth" on a day's admission. If we only have a couple of free hours we can still go see a few animals, hang out at the playground, have a picnic lunch and go home for a nap. :) We add the Mann Wildlife Museum to our membership because on hot summer days at the zoo, we can cool off inside and then head back out again. Plus, my kids are fascinated by the huge killer whale on display there. We always add the train rides to our membership, too! Because everyone loves to ride the train-sometimes more than once on the same trip. This year I added a guest pass to our membership, because my husband is often working when we want to go to the zoo and that way we can take any friend or family member with us to help with the twins to enjoy the zoo! Totally worth it! Grab a map at the entrance. Unless you go there often like we do, it's nice to know where the restrooms are and also how to find a certain animal. You could also pull up the map on your smart phone from the zoo's website. If you forget, there are lots of signs everywhere in the zoo that are extremely easy to follow. Take dollars for the food for the parakeets in Parakeet Cove. It's so fun to have them land on the treat stick you are holding and eat the treats. Ditto the petting zoo. Sometimes we save space and weight in our bags by bringing reusable plastic cups and just getting water from the water fountains instead of bringing bottles of water. Don't forget hats and suncreen. Check out the elephant training encounter at 2:30 pm daily. Follow the zoo on Facebook for up-to-date info. Fun to do: Look for the two elusive Pygmy Hippo near the Giraffe feeding station. Hint: follow the bubbles in the water. Go during the week when there aren't as many visitors. 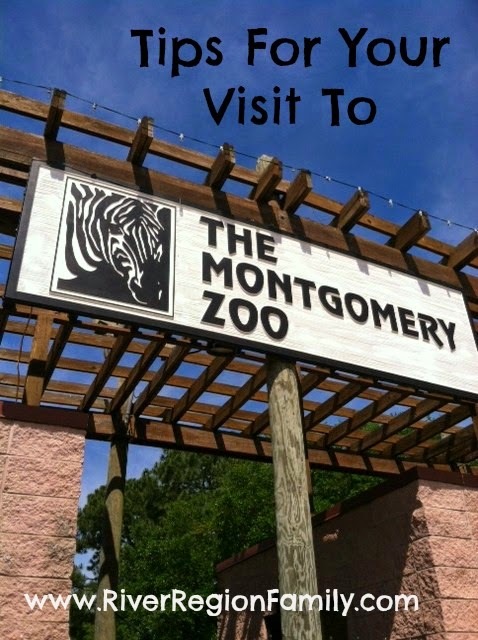 Father's Day is coming up and the Montgomery Zoo and Mann Museum offers free admission to fathers on Father's Day. They do the same thing for Mother's Day. Military Appreciation Day is June 19, 2014. All military personnel and their families receive FREE admission to the Zoo and Mann Wildlife Learning Museum. (With valid military identification.) Lunch, drinks and refreshments will also be provided. A special presentation with special military guests and Mayor Todd Strange will be given under the big tent. Lowe's Build and Grow 6/14/14 Sign Up Now!